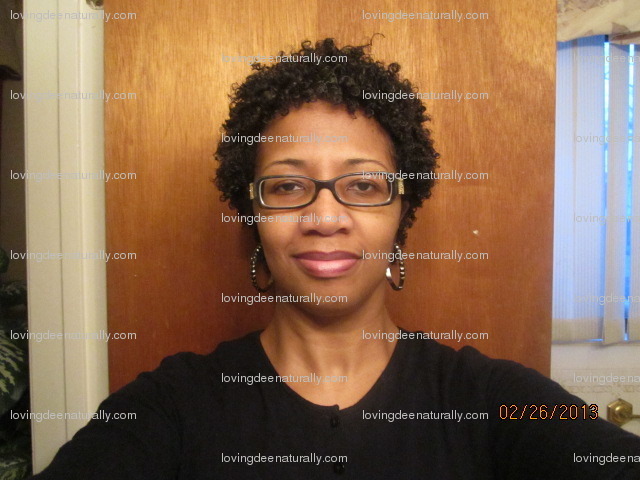 Loving Dee Naturally : Principles To Live By (my thoughts on Tightly Curly Method) ""
I have thoroughly enjoyed my foray into the Tightly Curly Method Challenge. 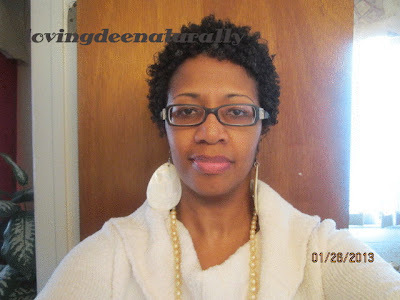 This challenge was 'sponsored' by the curly-haired beauty Farah of AuCurlsNaturelle. I stumbled upon Farah's youtube channel when I was researching more into the Tightly Curly Method and for curlies who had tried this method. Her videos and website gave me such inspiration to try this method and to top it all off she was starting a Tightly Curly Challenge!! This was right up my alley and sooooo on-time. This link will take you to the original challenge. While participating in this challenge in the last month or so I've come to the conclusion/realization that I'm not looking to follow a "method" or "person" for the sake of following a method or a person who has created a method. I was/am looking for a "method" for the sake of a technique(s) that I could use in the care of my hair. This has led me to focus more on the rudiments or basic/foundational PRINCIPLES that undergird this(or any) method and that are conducive to growing/maintaining healthy hair; PRINCIPLES or TOOLS presented in TC method that I can extract from my "tool box" and use at any given point and time to create any desired effect in caring for/styling my hair day to day, week to week, month to month, etc. It's the same with a hammer, nut, bolt, screw, nail, drill. These construction tools that are in your toolbox are there so you can use them when you need them but you have to know how to use each of them and what situation needs which tool in order to be effective at building whatever you are trying to build. Referencing Farah again, I was struck by a statement she made in her latest video. She said something to this effect. "TC method is more than just coiling your hair. It's a way of TREATING your hair...."(click here for exact quote). This statement resonated within me because this is what I had been looking for: a way to treat my hair that addressed the goals that I wanted to meet in the care of my hair rather than just blindly "doing a method". The TC method has given/shown me some techniques that have been very effective on my hair. My hair has responded wonderfully to what I have learned from this method and I don't believe this works for just MY hair(type). If one is willing to invest the time, I feel the principles in this method will be a benefit (definitely NOT harmful) to any and all hair types. I do realize that what works for one person's hair may not work for the next person's hair but I think that's relegated to products we choose to use and how we use them. ALL hair benefits from moisture. ALL hair benefits from a consistent healthy regimen. ALL hair benefits from techniques and products that reinforce/strengthen it's own natural state. ALL hair benefits from being handled gently. ALL hair benefits from efforts to protect the ends. I feel TC method addressess all these bulleted points but it does require an investment of time and the time it takes will decrease as your hair becomes accustomed to these techniques and you become accustomed to the technique. Many of strategies put forth in the TC method are basic natural haircare methods for afro-textured hair. 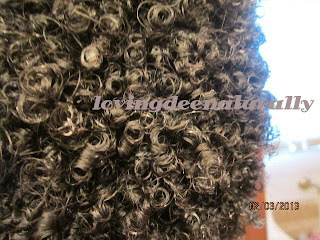 You can read up on them in detail from the TC website(www.tightlycurly.com) and I highly recommend Teri Laflesh's book, Curly Like Me for more info. 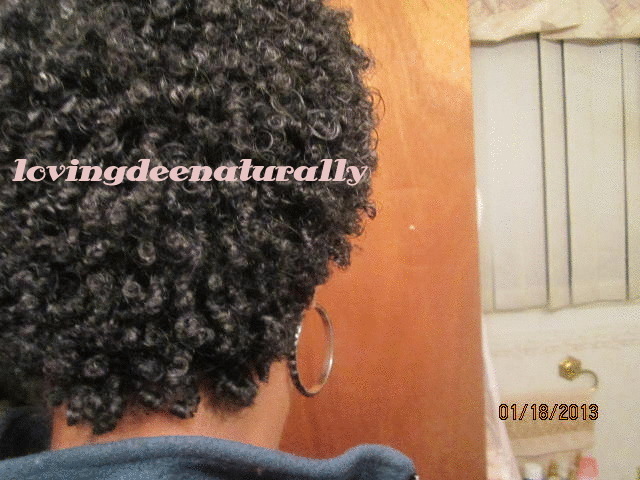 on styling, caring for children's hair, what to look for in conditioners/products, etc. I was already using some of these strategies like conditioner-washing, detangling gently(I use my fingers 99% of time), leaving rinse-out conditioner in my hair(I use silicone-free conditioners), detangling with conditioner-soaked hair, etc. so I didn't have to start from 'scratch'. smooth/define(doodle) and separate each curl *** this one was a biggie for me and the least attractive aspect due to the time it takes me to do my whole head BUT I feel it is one of the MOST important things that has contributed to the excellent results I've gotten. What I was mainly looking for in researching this method was a nighttime routine/morning refresh for short hair which didn't result in frizzy hair and one in which I didn't have to wet my hair everyday. These are the benchmarks that I came up with to see if this would be beneficial and worth the effort of participating in this challenge. Does this provide an effective nighttime routine for short hair that would eliminate frizz? Does this provide and effective way to refresh short hair in morning with no frizzies? - I really was looking for a way to refresh my hair without wetting it in the wintertime and although I do spritz my hair with this method I can use more conditioner than water therefore doesn't take long to dry. Learn the TC Method - Is this something I can physically do? Researching and studying and implementing the TC Method presented a welcome challenge to me. I thoroughly enjoy learning and meeting/supporting other naturals, especially those who learning this same method. Am I able to stick with this method? Goal #1 & #2. 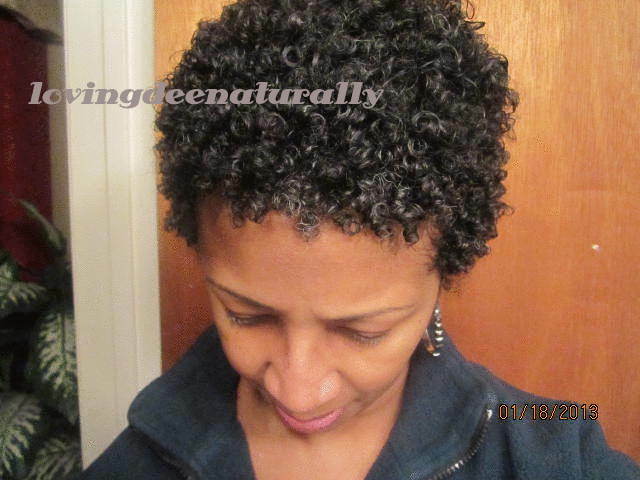 Yes, the principles in the TC method provide an effective nighttime routine for short hair that eliminates frizz. Because each curl is coated in conditioner from near the root to the ends of the hair, my hair is more protected from weather and even nighttime wear and tear. It is suggested in this method to braid/twist the hair at night but I didn't do that. Because my hair is still short I found that to be protection enough and my curls were preserved inside of the smashed 'bedhead' that occurs during the night. During the week I did have areas that began to get frizzy. 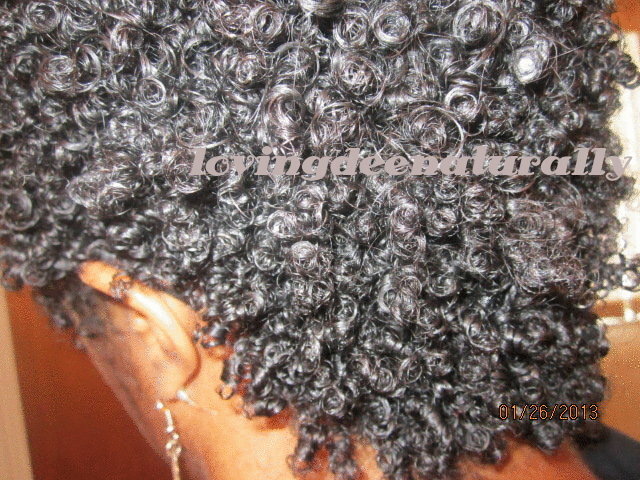 The remedy for that is to smooth each frizzy curl with a bit of water and conditioner. So, the frizz that I did experience I learned a new way of taking care of/eliminate it and to refresh my hair/style for the day with minimal water/wetting. Another item of note: I just love and want to wear my hair in it's curly state so I do very little manipulation during the week. I don't twist or band or braid. I don't re-twist at night...I used to just put on my satin wrap and go to bed. I did not have a lot of hair breakage or an abnormal amount of shedding either. I am convinced that a low manipulation regimen contributes to length retention. Now that my hair is longer I think the time has come for me to begin to put my hair in loose twists at night, at least in some sections of my hair. Goal #3. Yes, I was able to learn these techniques and apply them in my haircare regimen. The website www.tightlycurly.com was a major resource for me and is one place where I learned how to fully define my curls. Looking at Farah's results also gave me a real-life visual of what my hair 'could' be...not that I was trying to get my curl pattern like hers but I wanted healthy, gorgeous curls like her and I did achieve that. 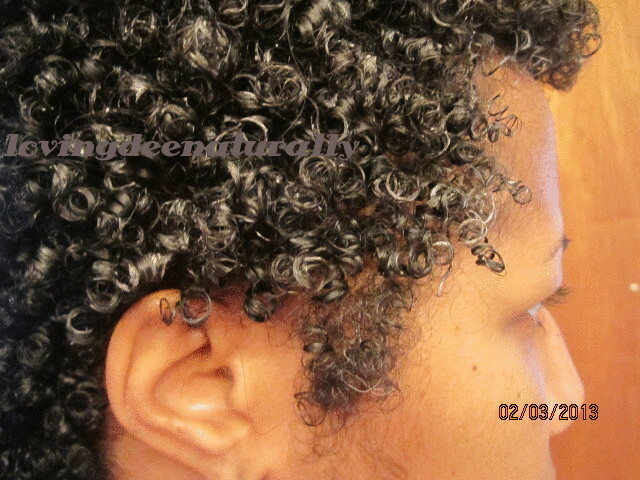 I achieved healthy gorgeous curls that reflected MY natural curl pattern, MY texture with MY volume/density. 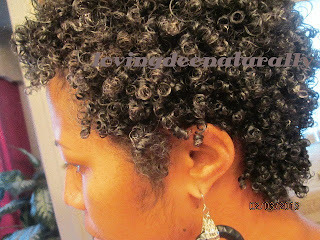 Also, learning from other curlies like Farah made this process more real to me b/c she was the first person that I found that utilized this method on short hair like mine. 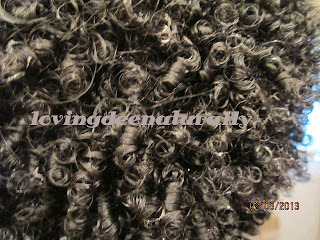 Like I mentioned previously, defining and separating each curl can be a very time-consuming process but the result is a head full of curls that are healthy, defined, well-conditioned and protected along the full strand of hair. This results in hair that is fully moisturized the resists breaking thereby able to grow to it's length potential. Goal #4. Yes, this worked for my hair. 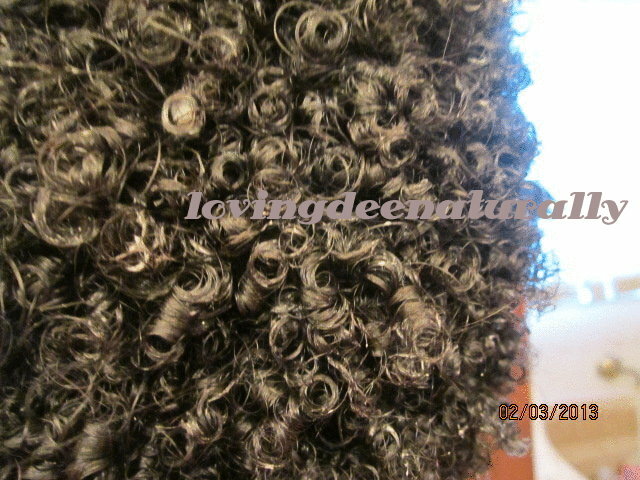 My curls were defined with excellent hold, shiny, soft, healthy, durable and looked good. 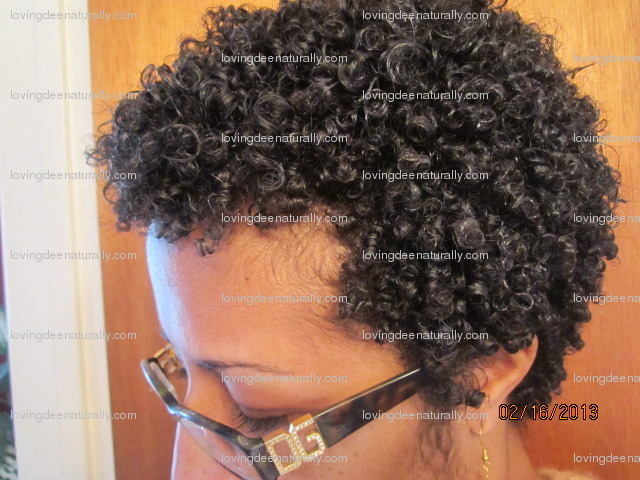 My hair continued to be healthy and my curls seemed to begin to coil on their own without me having to doodle/coil each curl as carefully as I did at first so this method reinforces your own particular individual naturally curly state. It does not work against your natural curl pattern but works with it, reinforcing and strengthening that curly state resulting in more defined curls. 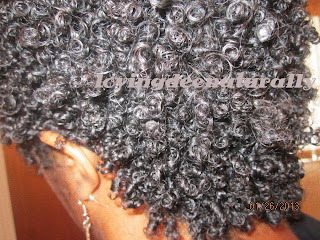 This method allows your hair to curl like it wants to, the way it is genetically meant to curl while being fully moisturized and conditioned. Also, my hair seems to have a had a sudden growth spurt in the last week. When I washed my hair this week and ran the water over my hair I felt hair laying on the back of my neck and over my ears and hanging/flopping in my face for the first time since I've been natural. My hair seems to be thriving under these techniques. Goal #5. I would say yes it improved the overall health of my hair b/c I've never had this much growth in 1.5 months as long as I've been natural as I've had doing this method. Goal #6. Yes, I can stick with this method (and/or even a modified version of this method...see book Curly Like Me for simplified version). Even if there are some weeks I don't do the 'full' method I've learned plenty of strategies I can use to get and keep my hair/curls looking like I like them to. In an effort to try to decrease the time I spend on defining/separating curls I've tried experimenting with using a modified method of defining, separating curls. After washing/conditioning/detangling my hair I would smooth and rake conditioner on all my hair in small sections to make sure to cover every strand and then give a good shake. Then once hair is completely dry then go back and more fully 'spot-define' any individual curl that didn't get fully defined and/or more fully 'spot-separate' any larger clump of curls that didn't separate all the way. That's my modified version and actually I guess I could label my HOTD dated Feb. 26, 2013 post as my modified TC method b/c that is what I did to achieve the look in that post. While I changed the order and the sequence in which I moved through the steps of TC I still adhered to the principles of the method. I was of the initial thought that I would not do TC on that week but looking back now I believe I have still done TC. I just tweeked it for my needs. silicone-free conditioner. My hair likes the techniques used in the TC method. My hair also likes the products I've been using and how I've been using them in this method. I will continue to do/use what my hair likes, whether or not I can classify what I do as someone else's "method" or not; it will be MY method; so long as my hair likes it. So needless to say the techniques/strategies/principles used in TC method of haircare are in my life to stay. This is not just a part of my regimen it will BE my regimen. 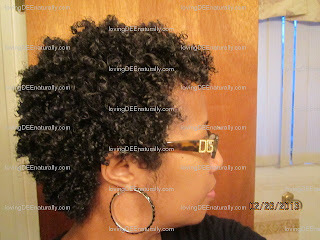 It will BE the way in which I care for and treat my hair while it's in it's naturally curly state. Girlfriend, u remember u told me I was going to fall in love with my curls b/c if I'm in curl love with yours and we are curl-twins then I"m going to fall in love with my own and surely I have!!!!! 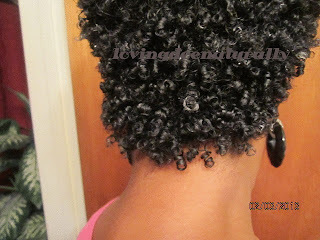 I've gone this week with a looser curl b/c I didn't coil each curl this week(wanted something different than the tight curl) and as I look through the pics on the blog I am missing my "tightly curly"!!! So when I do my hair in the next few days it will be the "full tightly curly version" :-) I love the versatility in styling, and even in the "treatment" of our natural hair!